Governor Alejandro Moreno Cárdenas informed that the municipality of Champoton will be included as part of the Maya Train route, to boost commercial, industrial and tourism projects in the state, such as the the Special Economic Zone and the port of Seybaplaya. “In the first stage of the Maya Train only Escárcega and Calakmul were contemplated, but after making an integral proposal that the new federal government received with good spirit, Calkiní, Hecelchakán and Tenabo were included, and the construction of a railway branch to Seybaplaya. “Champoton was annexed to the project that will allow us to have greater growth and tourism integration, while continuing to strengthen the energy sector,” he said in a statement. Moreno Cárdenas took protest to the members of the new Campeche city council for the period 2018-2021, which will preside the hew mayor Daniel León Cruz. 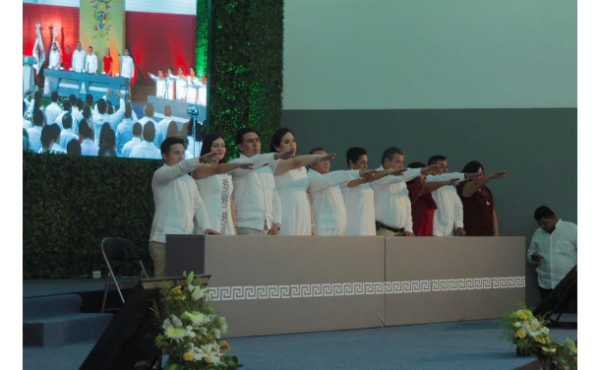 The governor said he will be the best ally of the next municipal administration all the , to make sure all the commitments made with the people of Campeche are fulfilled. He stressed that his government will strengthen teamwork and permanent management. In addition, he stressed that he has established a friendly and respectful working relationship with the next federal government, headed by Andrés Manuel López Obrador, and other federal legislators so more programs and resources reach the state for the benefit of the Campeche families. For his part, the mayor-elect Daniel Martín León Cruz called on the people of Champoton to work as a team to continue advancing in the fight against poverty, marginalization and exclusion.